You are currently browsing the category archive for the ‘landscaping & gardening’ category. In the warm months, there’s nothing better than coming home and immediately kicking off your shoes, grabbing an ice-cold drink and heading right outside. Sitting outdoors in the fresh air is a great way to loosen up, unwind and let go. Summer may still seem far off, but now is actually a great time to begin planning ways to make your outdoor space more comfortable — see if one of these 10 ideas will work for your porch, patio or yard. the seating area with big pots of fragrant plants, like lavender. 2. Patio hangout. Who says only kids get to have fun on swings? 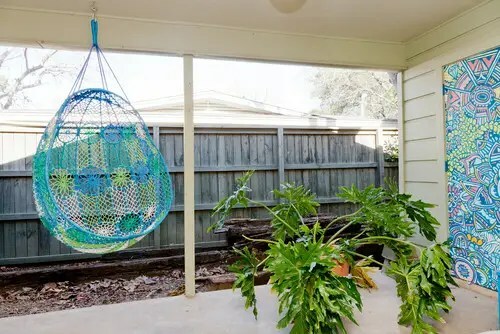 Juice up your patio with a colorful indoor-outdoor hanging chair and a few big potted plants with interesting foliage, and swing your worries away. 3. 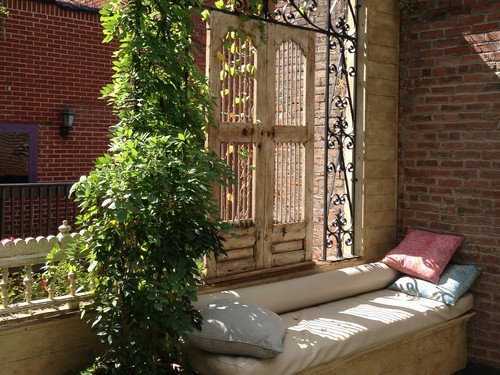 Secret reading nook. 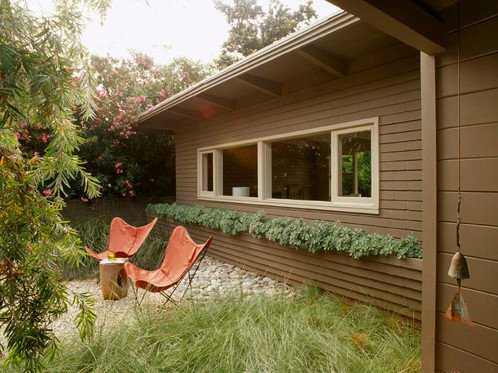 If what you love most is to escape with a good book, a tucked-away reading nook is what you need. 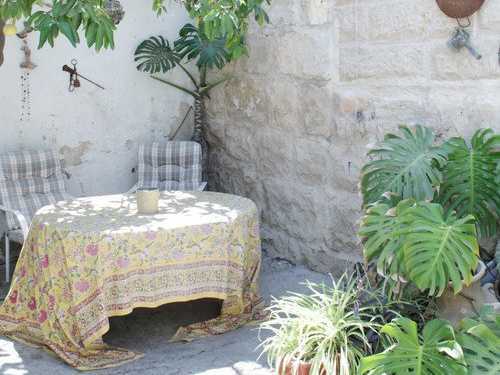 In a corner of this garden, a cushioned bench gets extra privacy from hanging vintage shutters and vines trailing down from overhead. 4. Napworthy porch. 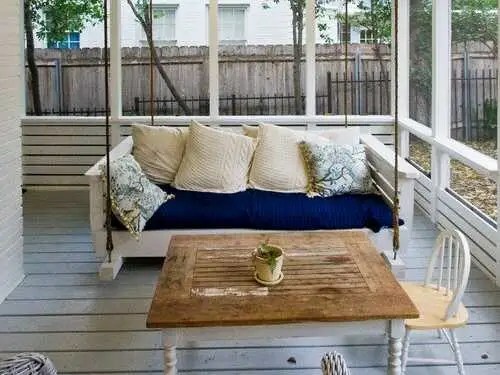 A covered porch is the perfect place for napping — the fresh air and gentle breeze soothe, but the roof is there to protect you if a sudden shower springs up while you snooze. Any daybed makes a fine napping spot, but I think the rocking motion of a hanging bed is especially restful. 5. Backyard hideaway. 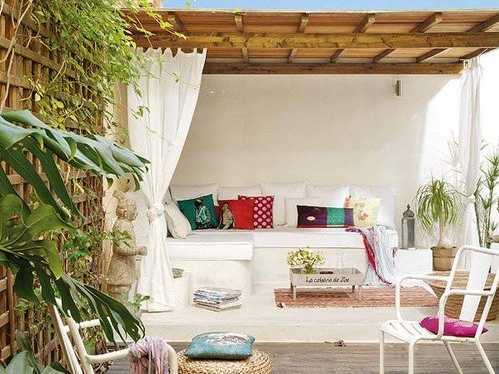 Make a simple pergola in the backyard feel like an exotic getaway by stringing up white curtains all around and placing a cushy outdoor sofa or daybed underneath. The curtains not only create privacy but can also be adjusted to block the sun on a hot day. 6. Classic hammock. If you have nice, big trees in your backyard, why not put them to good use? String up a hammock and let the relaxation commence. Come home from work, kick off your shoes, grab something to drink and make a beeline to the backyard. No trees? You can also find hammocks that come with their own stands. 7. Private dining area. Whether you want to dine al fresco or just bring a glass of wine outdoors on a pleasant weekend, having a welcoming table for two is essential. Find a place blocked from the wind — a corner of the garden would be ideal — and make it feel even more private by surrounding it in lush plantings. Keep a stash of fresh tablecloths indoors and carry one out with you when you want to hang out at your table — it’s the quickest and easiest way to keep your table looking fresh. 8. Tropical retreat. 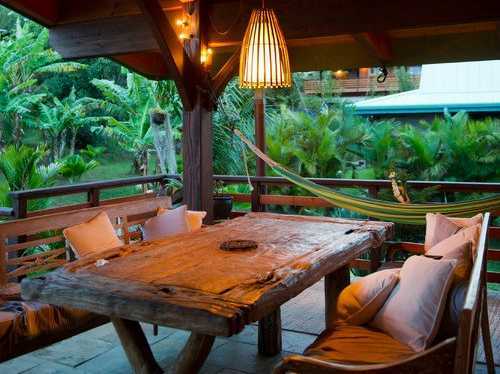 Deep, dark tropical and reclaimed wood furniture, moody lighting and a hammock converge on this porch to make an irresistible hideaway. Whether your idea of R&R involves pouring cocktails and playing cards with friends, or enjoying a little peace and quiet solo, a setup like this will have you covered. On a deck that gets a lot of sun, curtains or blinds can make the space much more comfortable. For a tropical look, try hanging simple (and inexpensive) bamboo blinds. 9. Rooftop refuge. 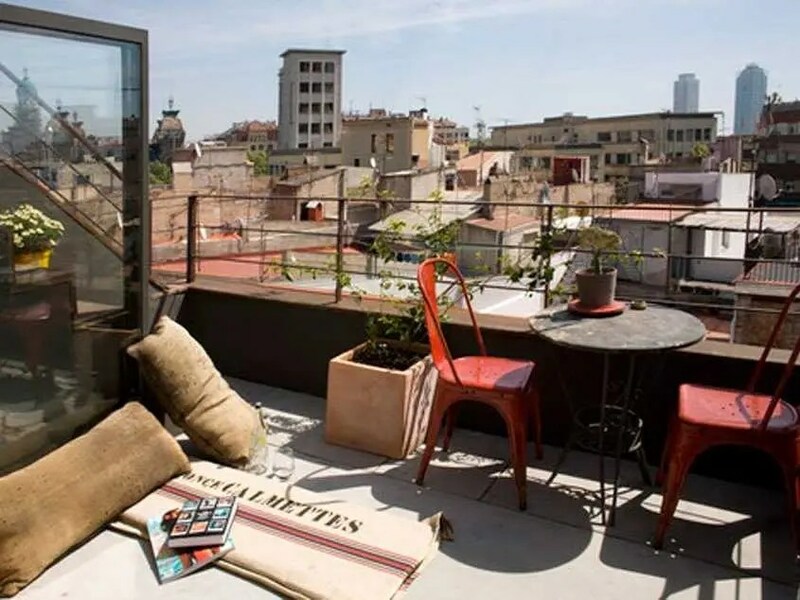 A chill-out zone like this one is essential for city dwellers. Even if your space is small (and the budget is limited), you can pull together a cute retreat with a café table for sitting and a blanket-covered futon and burlap pillows for lounging. 10. Simplicity. Sometimes all you need is a place to get away. Tuck a pair of chairs (butterfly chairs are always stylish) and a small table into a hidden area of your garden — perhaps even in a side yard. 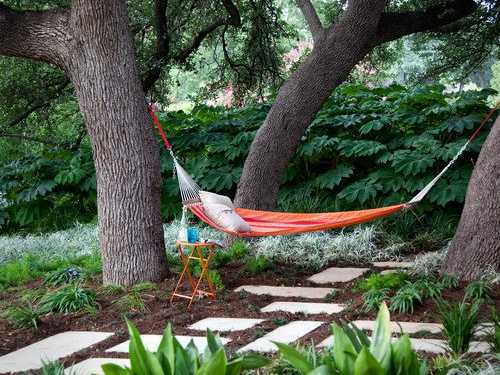 Surround the seating area with native grasses that will rustle in the breeze, and hang a wind chime for gentle sounds that help release stress. This article originally appeared at Houzz. Copyright 2014. Follow Houzz on Twitter. Make a great first-impression and rev up the marketability of your home with eye-catching plantings that hide foundation walls. These ideas come from HouseLogic.com. Best for: Front-and-center locations where hydrangea’s thick foliage and large, loopy blooms do a great job of hiding plain-Jane foundation walls. 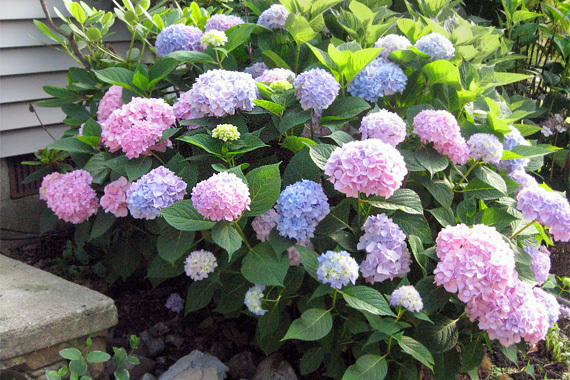 In neutral soil expect ball-shaped, pink and lavender blossoms; in slightly acidic soil, they’ll bloom deep blue. Ramp up your curb appeal with cool landscaping projects you can easily pull off in a weekend. The setup: A crisp edge where the lawn meets the flower beds looks great and eases mowing. 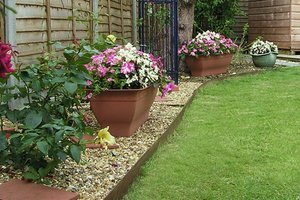 Opt for rigid edging — the flexible plastic stuff looks amateurish from day one. 1. Large kitchen 2. Energy efficiency which includes appliances, insulation & windows 3. Home office 4. Main floor master bedroom suite 5. The trend in gardening this year is going back to its 1980’s roots so to speak: integrating fruits & vegetables into general landscape giving beauty & food; including succulents & bromeliads which are easy to maintain but look exotic with their bright colors; adding colorful plants to each side of your driveway & not just to your entrance sidewalk; using semi-porous paths (stone or brick instead of concrete) which allow for better draining & therefore better for the surrounding plants & trees; and lastly, adding natural ec-friendly wood seating & dining spaces which are made of bamboo or eucalyptus. Labor Day through Halloween is your window for preparing lawns for a lush spring.